Love the theatre but don't always have the money to go as often as you would like? With thousands of tickets for all the top shows and events throughout London, a Lovetheatre.com promotional code lets you save money on the things you want to see. From musicals and children's shows to top London attractions and inclusive theatre and dinner packages, Lovetheatre.com offers a great value one-stop-shop for entertainment in the capital. Founded back in 1991, Lovetheatre.com was established as a reliable and affordable agent for customers wishing to book tickets to some of London's top shows. Today, it enjoys a position as one of the biggest and most respected ticket agencies in the UK, selling in excess of 750,000 tickets every year. As an official booking agent for all of the top London theatres, Lovetheatre.com has an exclusive allocation of tickets for every major venue which they sell on to their customers - allowing access to some of the best seats in town at a fantastic price. And as a full board menu of STAR – the Society of Ticket Agents and Retailers – the company offers customers the opportunity to buy tickets in confidence, safe in the knowledge that their transaction is protected and safe. Established to help consumers differentiate between reputable and non-reputable ticket sellers, buying from a member of STAR ensures a genuine product and excellent customer service every time. At Lovetheatre.com customers can browse and purchase tickets for a wide range of shows and performances across some of London's favourite venues, including long-running established shows like Billy Elliot, Mamma Mia! And Les Miserables as well as new and up-and-coming productions. Want to make a really special evening of it? Why not take advantage of Lovetheatre.com's exclusive package deals that combine tickets to a show with dinner at a choice of top London restaurants? Or perhaps choose a VIP package deal that combines show tickets with gourmet dining, Champagne and more? As well as theatre tickets, Lovetheatre.com also offers tickets to some of the capital's hottest events such as art exhibitions, ballet, opera, concerts, family events and more. Want to visit some of London's top attractions as well? The site allows you to book great value entrance tickets to all of the city's favourite sights such as the London Eye, SEA LIFE London Aquarium, Madame Tussaud's and many more. 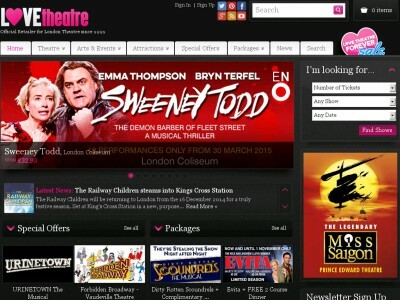 Want to get booking with Lovetheatre.com? With a Lovetheatre.com promotional code you can get great deals on everything you need to enjoy the very best of London. From sing-along musicals and edge-of-your-seat theatre to fun family days out, Lovetheatre.com offers a chance to get everything you need all in one place. Browse our website until you find the Lovetheatre.com offers that are right for you, then navigate to their website to begin shopping. Click on a show or event for more information, then click 'Book tickets' to book. Click on your desired date and time. Choose your tickets and click 'Proceed'. Enter your Lovetheatre.com promotional code where applicable. If you've enjoyed shopping for theatre tickets and more at Lovetheatre.com, why not make a weekend of it with our great deals on hotel stays from companies like Hotels.com or Lastminute.com? Or, if those aren't up your street, you'll find plenty more stores to browse in our Travel section. Looking for a store similar to Discount Theatre? Browse Others. Plenty of voucher codes and rabates for stores such as lastminute.com, Ticketmaster and Travelodge are to be found there. Enter your Lovetheatre.com offers where applicable. Fill in your details and click 'Proceed'. Fill in your address details and click 'Proceed'. Tickets are despatched free of charge via First Class post and take approximately 3-4 days to arrive. You can also choose to collect your tickets from the venue on the day of the show. Need to contact the team at Lovetheatre.com? Whether you have a question about your booking, want to know more about seating plans or simply want to find out how you could make big savings by taking advantage of the latest Lovetheatre.com offers, you can contact the Customer Services department by telephoning 0800 912 6959. Want to find out more about what's happening behind the scenes at Lovetheatre.com? Why not follow the company across your favourite social media networks? You'll find lots of exclusive content including competitions, promotions, show previews and much more. You can also use these pages to find out more about saving money with a Lovetheatre.com promotional code. Don’t forget to check them regularly, as you can never be sure when a free Lovetheatre.com promotional code might be waiting for you! Buy now online at www.lovetheatre.com. My husband and I used to love going to the theatre, but since the kids came along we haven't been able to justify the cost. However, thanks to the Lovetheatre free coupon code we found online we've been rediscovering our passion. There are loads of Lovetheatre bargains to be found at lovetheatre.com, whether you want a musical, a thriller or a comedy show. We just enter our Lovetheatre electronic code for fantastic discounts at the check out. So if you're a lapsed culture culture, why not see what you could save with a Lovetheatre voucher code?